The last Home Savings and Loan completely conceived by the Millard Sheets & Associates, in concert with Frank Homolka & Associates as the architects of record, was the expansion and renovation of the Encino branch at 17107 Ventura Blvd. This branch has practically a whole wall of stained glass, mosaics inside and out (though the interior vault mosaic is now hidden), a large interior mural, and statues in niches — as well as a pair of ceramic mountain lions, enclosed in decorative grilles. Given the volume and variety of Sheets Studio artwork in this branch, it may be the most comprehensive look at the Sheets Studio’s production, given the variety of subject matter as well as media. Two forty-foot[-]tall cast stone grill[e]s, designed by Tony Sheets, embellish the exterior while shading the large picture windows behind them. Sculptress Betty Davenport Ford created two 1000[-]pound mountain lions which are ensconced on pedestals in the grill-work. Each larger-than-life animal was directly modelled from clay, slip-glazed and fired. They represent some of the largest works of this kind ever executed. Like Sam Maloof, Martha Menke Underwood, and some of the other of the very best Pomona Valley artists, Betty Davenport Ford spent a period of her career contributing to the Sheets Studio artwork before dedicating herself completely to a solo career, creating sculptures of the natural world, distinctively stylized. At 88, she is still involved with the world of art ceramics, and her work is present in museum collections around the country. 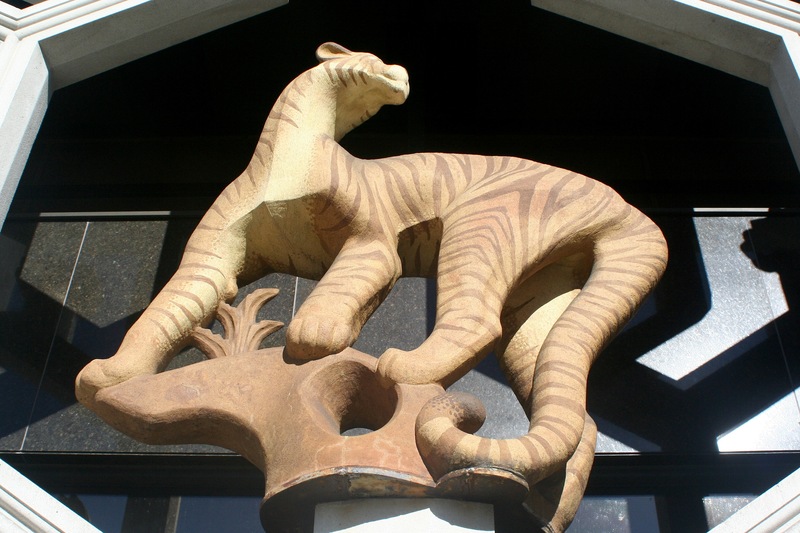 I have to think more about if the art of the Encino branch has a unified narrative–from mountain lions to working men and women, to farm animals and birds to a cowboy on horseback–but the lion could mark the earliest, primeval sense of the valley, especially given the local La Brea tar pits, and the remains of the megafauna–saber-toothed cats, wooly mammoths, dire wolves, etc.–that were found there in number. 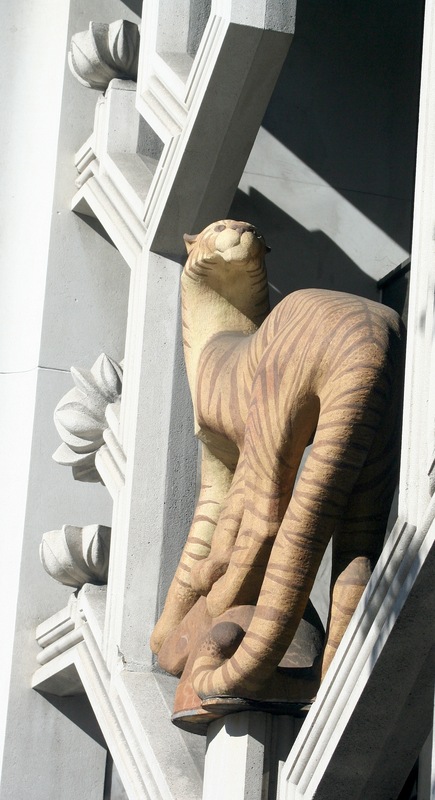 It takes the winged lion and says hey — take a look at this local lion instead! Though partially hidden by trees now, these lions in Encino announce proudly how Home Savings would guard that money. We often think of Millard Sheets as a California artist, and the Home Savings banks as a California phenomenon. Sheets was born in California, and did the vast majority of the bank projects in California—but there are other public-art projects, in Arkansas, Georgia, Massachusetts, Minnesota, Nevada, Washington, D.C., and Hawaii. (A full list, with dates, addresses, and current status is coming – I will finish it one of these months!) There are Home Savings banks with Sheets and Associates art in Florida, Illinois, Missouri, Ohio, and Texas, where Sheets, in fact, did one of his first banks, the Dallas Mercantile Bank, in 1958. This past week I had the pleasure of helping Scott Stoddard with stories for the San Antonio Express-News about a massive painting of the battle of the Alamo in the former Travis Savings and Loan in San Antonio. As he describes here, here (where I am quoted a few times), here, and here, the bank building was bought by the San Antonio Independent School District in 1994, and is currently in closing for sale to a new developer. The building has been empty, and Stoddard initially could not even get in to see the painting—but the latest story is accompanied by breathtaking pictures of the mural, 20 feet tall and 32 feet across. According to the latest report, the new owners plan to remove the painting and donate it to a museum. The mural is rich with action—from the perspective, we stand with the Texans with guns pointed over the ramparts, firing cannons as uniformed Mexican soldiers climb up the walls with ladders. The painting’s perspective runs deep, showing mesas and thunderheads, and what appear to be cattle trains in the distance. At the center—highlighted by a white shirt and a simple, unmistakable gesture of being hit—is Col. William B. Travis, one of the leaders of the Texan Revolution to be killed in the fighting. Even teaching in El Paso, far from San Antonio, the basic mythology of the Alamo and its importance to Anglo Texans has become second nature to me. Stoddard wonders whether this may be the largest painting of the Alamo anywhere in the world, and has worked to get estimates for such a large, intricate work, with suggestions running into the hundreds of thousands. I am glad the painting is getting attention and will be preserved, and I plan to learn more about it in the archives soon. Sue Hertel and Denis O'Connor, Castle Hills mosaic. Image courtesy of Scott Stoddard. But something I did see this week in the archives of the Texas projects provided another perspective. The Texas Home Savings banks came later, in the late 1980s, and so their artwork was commissioned from Denis O’Connor and Sue Hertel, Sheets’ former assistants on these projects who had begun working for themselves. One such mural was done for the Castle Hills branch, at 2201 NW Military Hwy in the San Antonio region. The final design, of horses, cowboys, and their animals, reflected direction from Richard Massey, the local bank manager, “to use scenes of early Texas Pioneer cultures (German, English, Irish) over a background of wild flowers.” UPDATE: Scott Stoddard emailed a sharp photo of the Castle Hills image, to add to his great images of the Travis S&L mural. In processing another recommendation that “the Spanish influence was good, but overdone,” Denis made a quick note in his planning: “No Alamo – Mexicans, etc.,” hinting at how the Texan Revolution—and especially the all-out war between the U.S. and Mexico that followed in 1846—was a bitter memory for many long-established Hispanic families or newer Mexican American residents, and something to avoid when courting new bank customers. When it comes to remembering the Alamo, then, Millard Sheets and Associates were ready to be on both sides. We can be too—in seeing that both are preserved. In late December I had a chance to go see the Loyola Tapestry — one of the most detailed and clearly the most labor-intensive of the Sheets Studio projects, surpassing the “Touchdown Jesus.” It is obviously not bank art, but it is art intended for public display, reflecting on world history, and an amazing example of Sheets’s work in another medium. Conceived as part of a gift from Edward Foley for a communications art center designed by Edward Durrell Stone, only the cartoon stood ready at the building’s dedication, in January 1964. According to documents I found in the LMU archives, it took seven weavers (working an inch a day) two years and three months to create the tapestry, which is reputed to be the largest modern tapestry in the Americas and the third-largest in the world. Eighteen feet by thirty-four feet, it was hung in March 1966. According to the press release, the design emerged from “long and serious analyses of the them concept” by Rev. Charles Cassassa, S. J., the university’s president at the time, and Mr. Foley, working with drawings that Sheets evidently provided. 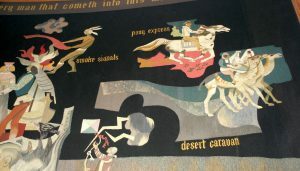 The Loyola Tapestry, especially designed for the foyer of the Edward T. Foley Communications Arts Center on the Loyola University of Los Angeles campus, symbolizes the meaning and means of communication created by man. The total theme has been divided into three basic areas: communications from man to man, from man to nature, and between God and man. The central figure of Christ with the Wings of God symbolizes man’s search to understand the Infinite and his own spiritual faith. 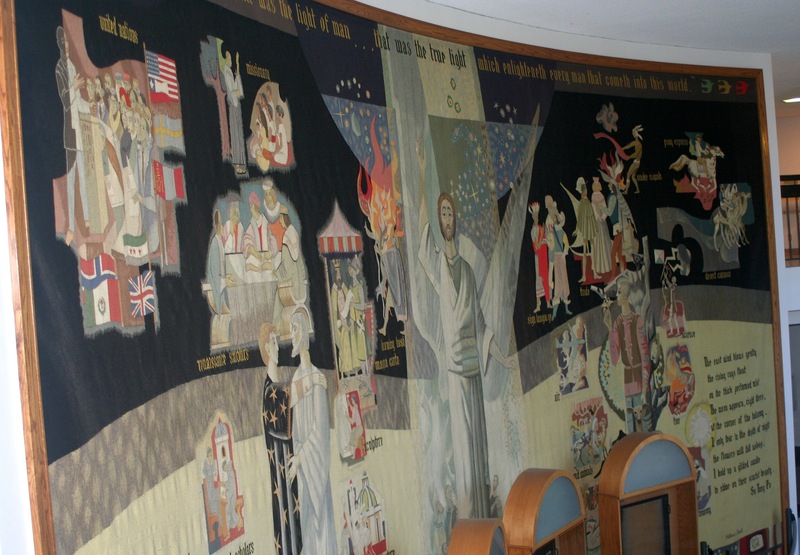 On the extreme left side of the Tapestry is the theme of communication between man and man. The symbols of scholarly and creative expression are noted in the small vignettes that surround the two figures indicating brotherly love. The smaller symbols of the Renaissance scholars, the Magna Carta signing, the United Nations, missionaries, the various arts are all facets of man’s desire for cultural, social, and political understanding. 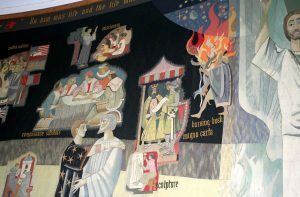 The small band of symbols at the bottom of the Loyola Tapestry on both sides are expressive of the techniques man has developed as means and methods of communicating. Various alphabets, printing, telephone, motion pictures, and communication techniques are included. 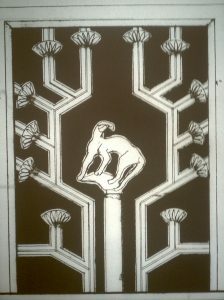 One the right side of the Tapestry, communication between man and nature is pictured by the central figure of the young man’s love of plant and animal life. The smaller symbols represent man and his use of fire for warmth and cooking, the domestication of animals, conquering of air, water for food, and related ideas. The total theme is designed to indicate many of the great accomplishments of man in insight and inventiveness to express the variety of urges and feelings he needs to express to others. I would also hope that in the spirit of the Loyola Tapestry the beholder will sense the possibilities of the infinite future of new and greater means of communication that lie ahead if discipline and imagination are matched with a deeper desire to face the great problems of our times. Man desperately needs to improve all present techniques for communication. He must determine greater objectives for each separate language and skill if mankind is to enjoy a future with assurance and depth. On its edges are quotes from the Gospel of John, the 12th-century Chinese poet and painter Fu T’ung-Po, and the 20th-century Jewish philosopher Martin Buber; add that to the Pony Express, the United Nations, the large figure of Jesus, and you get quite a capacious image of communication. It also makes an interesting contrast with Cold War-era brochure about the need for such a communications center: “In olden days the enemy poisoned wells,” it declared. “Today the enemy poisons men’s minds,” and hence it was time to fight back with communications arts–marketed quite differently today, amidst the cell phones, Facebook revolutions, and satellite TV. How exactly this all came together — that Foley decided he wanted artwork in the foyer, and to pay for a tapestry rather than a mosaic or painted mural; that such a wide-ranging set of quotes and images were best for the new communications building at a Jesuit college; and that Sheets, as a Protestant, became the artist of choice for Catholic institutions from Loyola to Notre Dame to the “Triumph of the Lamb” in the Basilica of the National Shrine in Washington, D.C. — remains unknown to me. 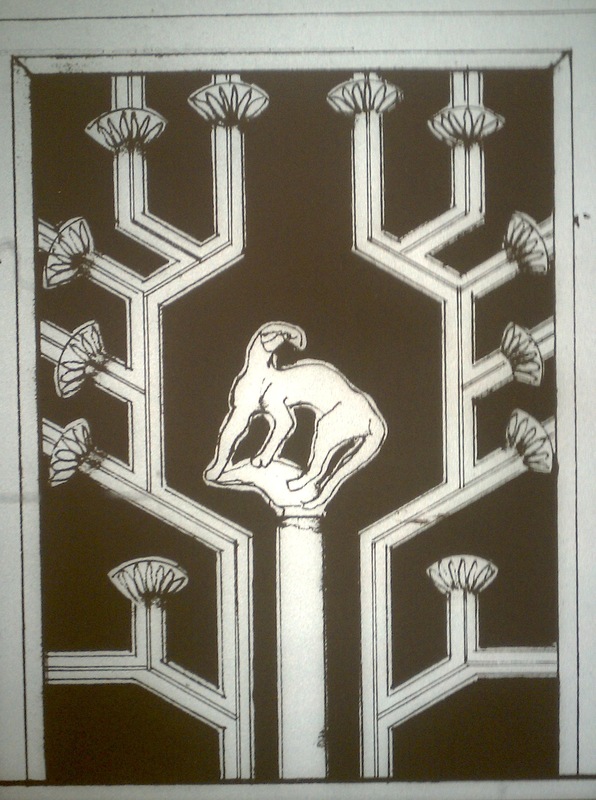 I do know that Martha Menke Underwood, who had worked in Sheets’s studio, was dedicated to the art of tapestries in these years, and that the Sheets Studio had produced some tapestry designs for banks as well. Thanks to the LMU Archives for their help in finding and copying items from their collections. Following up last week’s post and staying at San Francisco’s West Portal, if we walk outside, we encounter the most international of the Home Savings artworks, the Sheets & Associates “Gateway to the Pacific” mosaic. The concept of a Pacific Rim, interconnected by commerce, entertainment, migration, and cultures, is an old one — statues in Easter Island suggest that these connections may predate Christopher Columbus’s voyages. But the 1970s saw a return to thinking about the Pacific Rim, with President Nixon’s visit to China, the rise of the Japanese economy, and the start of the “Asian tigers” economic phenomenon, and the flood of goods made in Japan, Taiwan, or Hong Kong. The representative figures from each Pacific Rim nation come in pairs, a man and a woman, and each is engaged in what might be seen as a representative task, a labor linked to agriculture. From what I can tell, the Mexican couple carries flowers (calla lilies), the South Pacific pair a fishnet and fruit; the Californians wheat (I think; very hard to tell); the Australians care for sheep; and the Japanese carry also carry grain bushels. The figures do not interact, and do not appear in geographic order; four of five men wear sunhats. Only the Japanese woman looks out at us; all the rest are engaged with their labor, or the labor of their partner. This is a very unusual work, not only for the international theme. 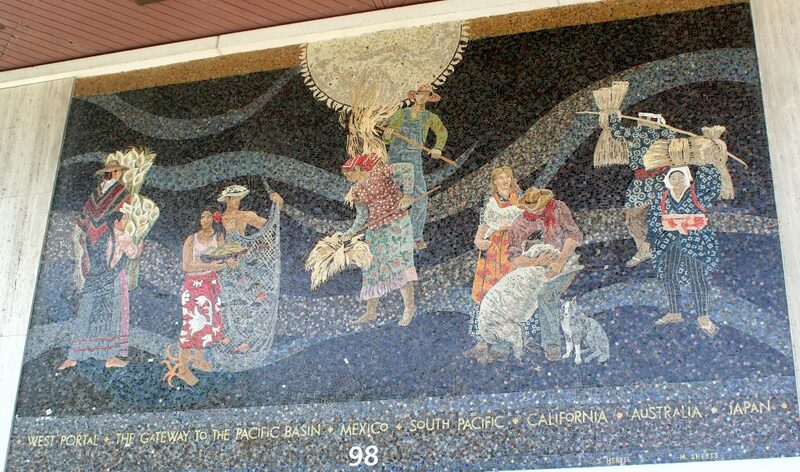 Besides the large sun overhead, which (given its inclusion in the Beverly Hills, Encino, and other mosaics, is a kind of Home Savings theme), there is no way to look at this and say, immediately, this was a Home Savings artwork. What it looks more like was the artwork that Millard Sheets created after his trips around the world, and in commissions for United Air Lines and other international-themed places. Though exhibits like the LA County Fair exhibit organized by Tony Sheets highlighted this international side of Sheets’s work, it seems a world away, literally and figuratively, from the standard Home Savings topics and designs. Given the radically different artwork that Sheets, Hertel, and Denis O’Connor created independently, outside of the context of the Home Savings work, makes me wonder where the “Home Savings style” originated. Sheets did the original designs, and so the answer lies with him, in one sense, but — the early works like Beverly Hills also feel atypical, in their way, and Sheets, in any case, had to have some idea of what Howard Ahmanson wanted for Home Savings. Sheets chose California community themes, but were those works only possible in one style? Clearly not. Mosaic makes certain demands; so stained glass, and so Sheets and Hertel, painters by preference, made concessions to form. But the differences so evident here — the colorplay in the tiles, the abstracting lines, the sun are the same, but the figures seem cut out of a totally different scene.